There are several possible causes of noise coming from your freezer or refrigerator. Given there are 3 major parts that having moving components, these would be the 1st area to check. These are the Condenser fan, Evaporator Fan and the compressor itself. Check each to see whether they are excessively noisy. Condenser and Evaporator fans can be replaced, some with relative ease while a compressor is not practical to replace as a DIY fix given that there are EPA restrictions around the responsible and safe handling of refrigerants used. Also cost is often a component which may result in a decision being made to replace rather than attempt repair. In these situations it is advisable that you have a professional verify that a compressor failure is eminent or has occurred. On more sophisticated refrigerators there are causes of Nosie ranging from noisy inverter boards, mechanical defrost timers, motor driven baffler systems, auger motors in icemakers etc.. Often these components can be identified through careful observation but in many instances calling a pro may be a better bet. You could likely pull out your appliance from its home 50 times with a problem but damage can happen very easily if not careful. We have learned that an unplanned sideways skid move or a grain of sand caught under a wheel can scar any floor. We use special Polyethylene mats and Teflon runners to help ensure we move appliances. You should at the very least, lay down a cardboard runway before dragging out your appliance. Better still get a piece of 1/8’ hardboard easily available from Home Depot or Lowes. 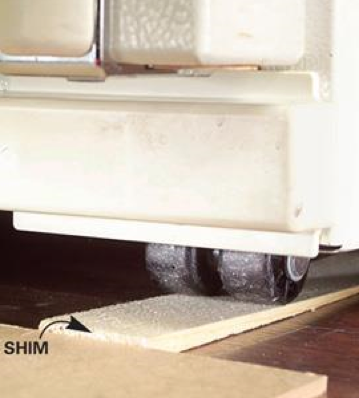 Use a pair of shims to use as ramps to ease the appliance onto the hardboard placed in front of the appliance. At times you may need two people for large units to safely remove. Electrical Shock is a real danger working on any appliance. Always unplug the appliance when working on the unit especially when replacing parts. You should only diagnose with power applied if you fully understand the system you are working on. Saving a few dollars on a repair will quickly be outweighed by the cost of a hospital visit or worse. If you do not have the knowledge or confidence to do these types of repairs yourself call a Pro. Damage caused by water is very real and can be tremendously costly. I have lost count of the number of times we have been approached by homeowners asking us to fix an appliance which had been leaking over a period of a few days, weeks or months unnoticed until floors had started to warp, tiles lift. Working with gas is best left to a pro. Risks associated with errors can be catastrophic and deadly. Unless you have experience working with such systems, you are best advised to have a professional perform the work who can ensure that the unit is performing correctly and that no gas leaks exist using manual methods of inspection and electronic detection equipment. Also check that no Carbon Monoxide problems may have been introduced.